When European settlers arrived in South Gippsland during the period 1870 to 1890 they faced many difficulties before they became established. Adverse climate and terrain, inadequate roads and transport all had an impact on early building techniques. The greatest priority was somewhere to live, the South Gippsland climate can be cold and wet for much of the year so some form of shelter was essential. Transport in the early years was very difficult too due to the dense forest, the hilly land and the wet climate, which made the tracks a sea of mud in the wetter months. These wet conditions limited wheeled transport and made the pack horse or what a person could carry the only means of moving their basic needs. This made the transport of building materials almost impossible. Only small items like nails, screws and hinges could be transported. The tools needed for building also needed to be light and easily transported. Axes, cross-cut saws, mauls, wedges and froes for splitting, broad axes and adzes for shaping were all necessary. Many general purpose tools such as hand saws, hammers, augers, chisels and draw knives were also essential. 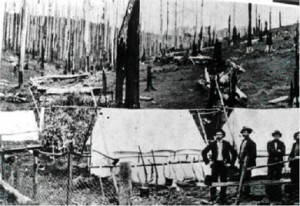 Many settlers brought tents with then and used then for a long time after arrival. Even a tent needed a space to be cleared before it could be erected. Clearing however, produced building materials for a simple dwelling and so these pioneers started building huts. Sawn timber was rare as there were no saw mills so timber was cut with a pit saw, a very slow process. Most buildings were constructed of round logs (spars) or split timber from larger trees. Most settlers were novice builders so building methods varied enormously as did the materials used. These materials were determined by what was available near the sit. Settlers used the materials at hand to make a home in the bush. 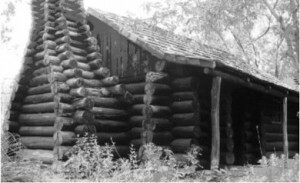 Some built log cabins in the North American style, where suitable trees were available. This method used straight tree trunks about 6 to 8 inches in diameter, laid on top of each other. The logs were notched at the corners to reduce the gap between them. Any gaps were then packed with clay or mud mixed with fibre to reduce draughts. This log cabin is at Coal Creek Heritage Village, Korumburra. This particular example has a shingle roof. Another method used a frame of round poles set into the ground with the space between being filled with split slabs or bark depending on what was available. 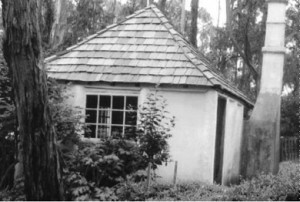 This slab hut with a shingle roof appears in Coal Creek Heritage Village, Korumburra. 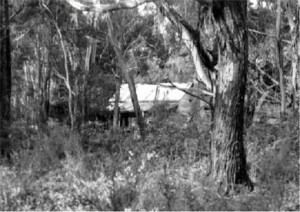 On the coastal plains country where there were fewer suitable trees, many wattle and daub structures were built. These were constructed using round poles fairly close together and between these small flexible branches were woven similar to a cane basket. This was them packed with mud or clay, plastered with cow manure if available and then whitewashed. 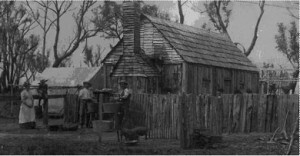 As houses became more robust, settlers started to enjoy the creature comforts including roofs, floors, chimneys, cooking and lighting. Floors in early buildings were mostly bare earth packed as firmly as possible. The earth may have been treated with oil or animal blood if available to reduce dust. Mats were placed in appropriate places for example next to beds. 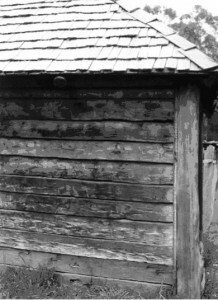 Roofs were often constructed using bark from the stringy bark eucalypt. A large tree could easily provide sheets of bark 10-12 feet long and 6 feet wide. This bark covered large areas quite quickly but had to be quite steep to be effective. Once on the roof bark was held down with wire, raw hide thongs and a frame of round poles. 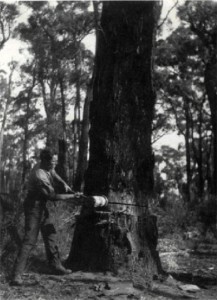 The main problem with bark was that it was not durable in the South Gippsland climate and may have only lasted a few years. House with shingle roof and picket fence. Shingles were probably the most popular long term roofing material although much preparation work was required. They were made from straight grained, free splitting timber such as mountain ash, were about 2 to 3 feet long and 4 to 5 inches wide, tapered at one end and then nailed to the roof frame. Well made shingle roofs were very weather resistant and durable, possibly lasting several decades. Many of the second generation buildings, including additions to the originals used a stud wall construction with timber weather board walls and wooden floors. The timber for the studs, top and bottom plates, bearers, joists and rafters could be either split or sawn with shingle or corrugated iron roofs. Corrugated iron was available from the early days of settlement but it was rarely used because it was too difficult to transport. Later as availability improved corrugated iron was often used over a shingle roof as it began to deteriorate giving an excellent result as the shingles acted as insulation. Chimneys and fire places would have used the same construction as the dwellings. Timber constructions would have been lined with a sheet steel of some sort such as discarded kerosene tins or galvanised iron. Lighting in early dwellings would have come from the fire place or a slush lamp, an open container of animal fat with a floating wick. The light was poor and the smell rather offensive particularly if the fat was rancid. 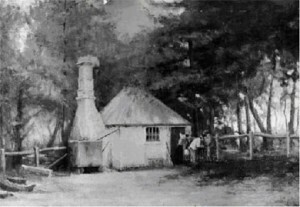 Later the kerosene lamps of the wick and pressure variety would have been used until electricity was connected. Candles, either home made or commercially made were another lighting source. Cooking was done outside in the open on an open fire, inside the building in the fire place or in a separate kitchen building. This provided protection for the family’s possessions in case the cooking fire burnt down the building. All of the building methods mentioned in this section are represented at the Coal Creek Heritage Village, Korumburra.